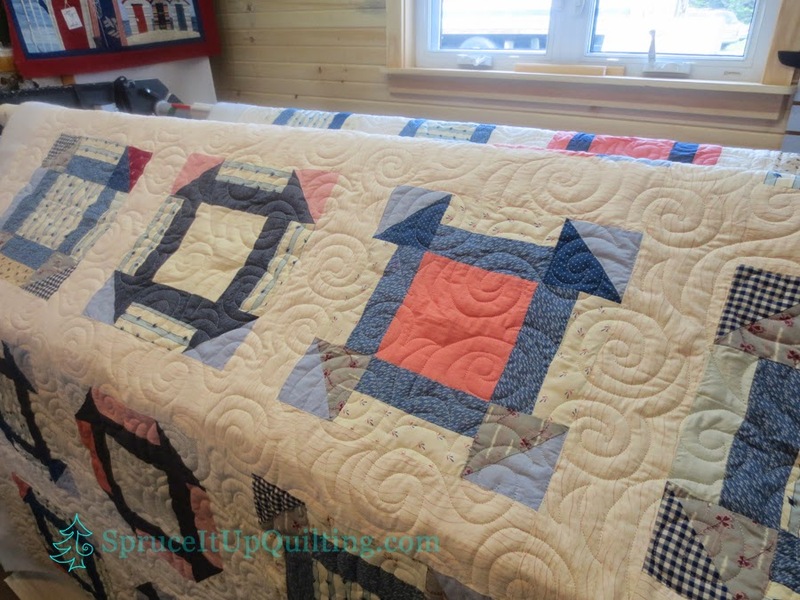 Spruce It Up Quilting: Barnside! 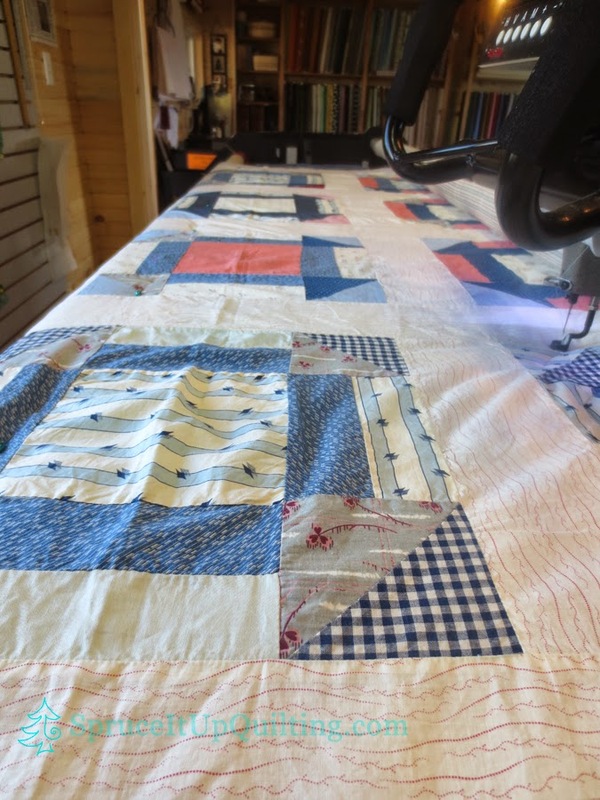 You did a great job integrating all the tops particular idiosyncrasies and turning it into a lovely, cuddly comforting quilt, Lorette! Love the backing! And don’t you enjoy Anne Bright’s pantographs? I don’t own any, but her designs are very distinct and always attractive. And Glide?? What can I say? I use others, but always go back to Glide with 100% satisfaction with tension and ease of execution! Did you see their new variegated threads? Yummy! So sorry to hear about your friend’s diagnosis. I am sure your gift will be well received. Jennifer, I was sure you purchased some Anne Bright pantos at Road... I'm surprised! :) I did see FilTec's new thread which I will definitely want to try... do you? Let me know! I was pleasantly surprised after I took this quilt off the frame... it looks great and despite those issues mentioned, this quilt was square! And it remains so. I know our friend will love it! Nope, didn’t buy any pantos at all at Road. I actually just ordered 5 a couple of weeks ago and still haven’t used any of them. I did receive 3 with my machine when I bought it and I have used a few from Linda Taylor’s book which are copyright free and you can adjust the size as you wish. Other than that, I either draw my own or freehand quilt. Didn't we sit there one night and compare our panto purchases?? Or did I dream that? Man where was my head? You're doing a fantastic job at drawing your own... and freestyling! I'm so sorry Linda. I keep trying and everytime I think I'm back to normal on blogger, something happens and it reverts back to Google+. My internet guru is not due here until Christmas. He'll be doing some work for me and I hope he can fix this for good! Meanwhile, I thank you for your patience and for your kind comments. 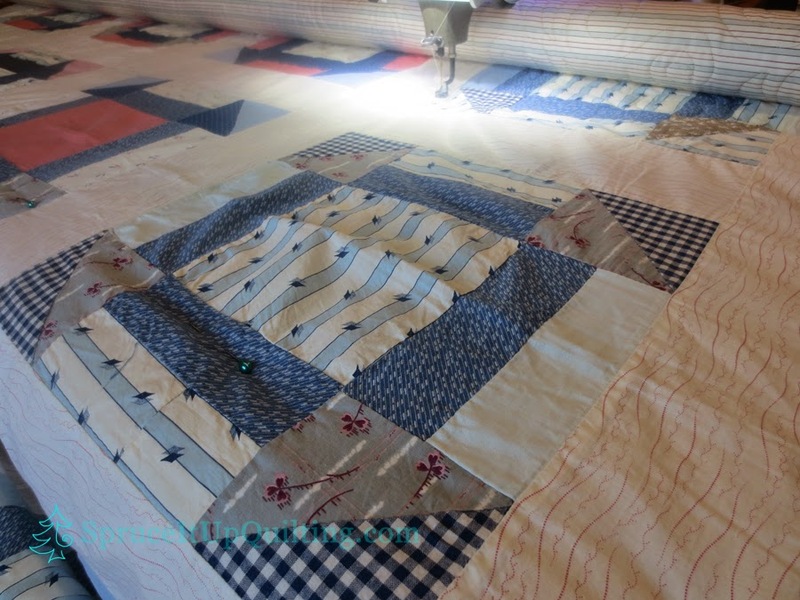 It was a challenging quilt and I was dreading quilting it until I decided there was no time like the present to tackle it! I'm thrilled it turned out so well! Hi Deb, That top has become really soft and the batting and backing will protect the delicate seams. It's ready for some love!! It turned out beautifully! Your friend will treasure it. I have long armed a few older tops as well and have a few more to do someday. Thank you for visiting and your kind comment Katy. BTW: I love your practice pieces... great job!!! 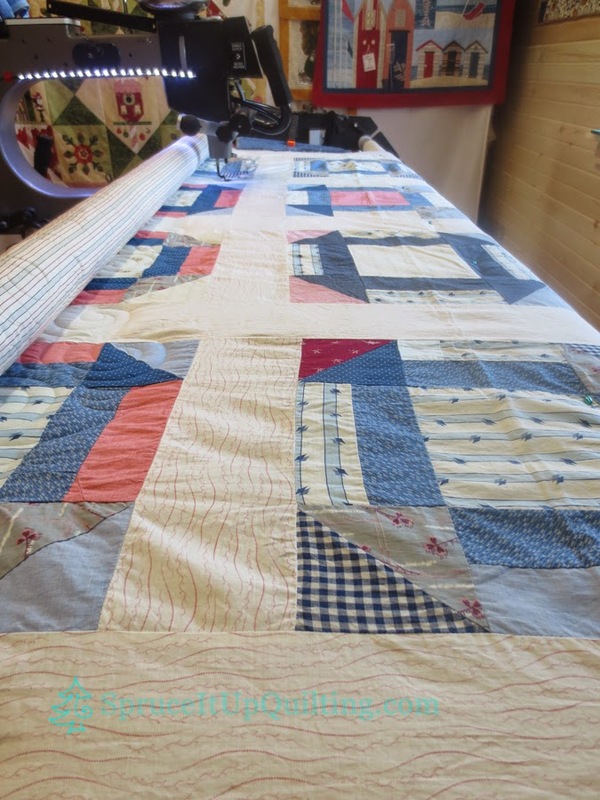 Your CApe Cod quilt looks terrific! I am wondering if you could send me your mailing address as I am going to send you some hand dyed fabric. YOu left a comment on my blog last week and all 3 will be getting some. 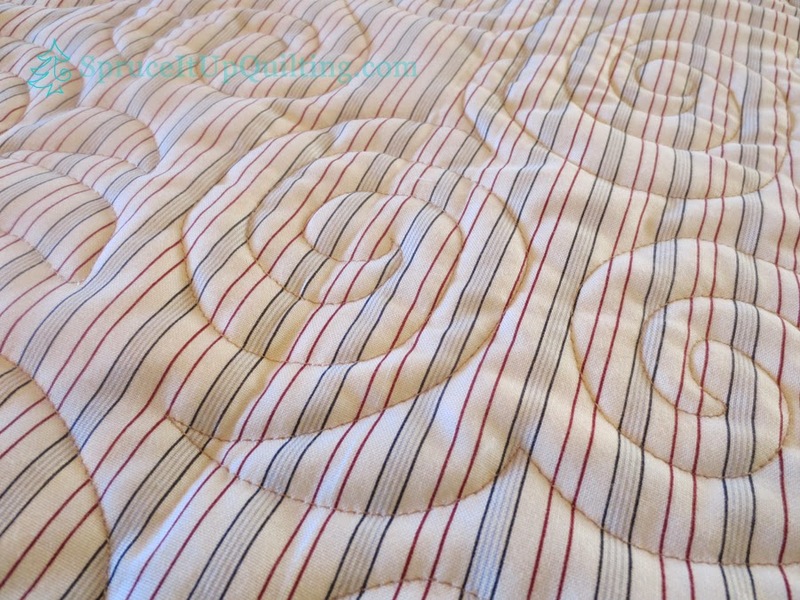 thank you so much for your comments on the Deauville quilt! I am so sorry to hear about your friend. You will all be in my thoughts and prayers. I guess that quilt has been sitting there, patiently waiting for just the right use. I'm sure the original maker would approve of everything you've done. Your friend will have a warm, gift of love, to wrap himself in. Thank you Jo. It is sad to know how sick he is. I hope he can find some comfort and warmth with this quilt. The owner would approve of it going to this gentle man! What are your hours of operation....I have a seasonal close by and would love to drop in to see your shop!! thanks!!!! Mon-Sat 10-4pm (or later if you call ahead). We'll be closed tomorrow because Spruce It Up Quilting has a booth at the Lupin Quilt Fair and Market in Port Elgin (Sat-Sun).